How To Buy The Best Ebook Reader - Which? Kindle or Kobo? Wi-fi or 4G? Ebook reader or tablet? 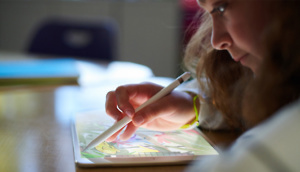 Our expert guide will help you pick the best device for you. Ebook reader, tablet or smartphone? The best ebook readers available can store thousands of books, magazines and newspapers, so you'll never run out of reading material while you’re out and about. While ebook readers aren't especially cheap, you can expect to pay much less for an ebook than you would on a physical copy of the latest hardback or paperback, once you've made that initial outlay. 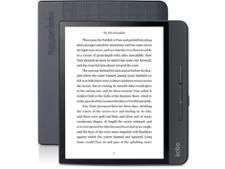 Ebook readers can range in price from under £80 for budget models like the Kobo Aura and entry-level Kindle (2016) to over £230 for Amazon's Kindle Oasis. Each of our Best Buy ebook readers are easy to use even for ebook newbies and offer a top-notch user experience. To get a Best Buy ebook reader that can be read in all light conditions - from a sunny summer's day to the middle of the night - it's worth paying a bit extra to get a superior display and adjustable built-in light. Below are our top four choices for ebook readers in 2019. Click through to each review to find out more. This high-end model is packed with features and a sumptuous, large screen. It's expensive, though, and only those with very specific needs should consider it. This mid-range model does a decent job in all tests and has plenty of useful features. 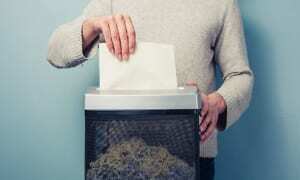 It's a little cheaper than its main rival, too, making it a tempting choice. 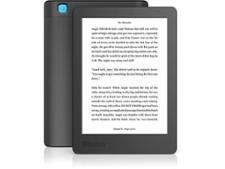 This large ebook reader is well worth a look and features lots of premium features. It's an easy Best Buy. This mid-tier ebook reader is our highest-scoring model, which is impressive given the price. It's well worth buying and is the best-value ebook reader around. An ebook reader is designed specifically for reading ebooks and not a great deal else. However, you can also read titles on an iOS or Android smartphone or tablet using ebook apps from Amazon Kindle, Google Play and more. Some ebook readers let you browse specific web pages, but the experience is limited. If you want to read books in digital format, you'll need to decide whether to spend your money on a dedicated ebook reader or use a smartphone or tablet app instead. Read on as we take a look at the pros and cons of each option below. Pros - The e-ink display of an ebook reader is designed to be easy on the eye, so you should be able to read even under direct sunlight. They're designed to be light and slim - even lighter than the average paperback - and offer weeks of battery life at a time. 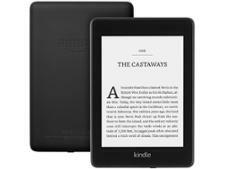 Ebook readers also tend to be cheaper than smartphones and tablets, with basic models costing less than £70. The very latest Kindles also support audiobooks and text-to-speech. Cons - The black and white e-ink screens of ebook readers fall down slightly when it comes to displaying images or any content designed to be shown in colour. Ebook readers also offer a relatively poor web browsing experience compared with tablets and smartphones, while some don't offer any online browsing at all. Pros - The most popular ebook reader apps are often free on mobile devices, meaning you won't have to pay extra for an ebook reader to get access to a whole library of ebooks. The screens of the best tablets and smartphones are bright and colourful and will display picture books in a much more vibrant style than an ebook reader. Tablets and mobiles are versatile and able to browse the web, play videos and perform all kinds of other functions. Cons - Average battery life on tablets and smartphones is much lower than ebook readers, so you might find yourself running low on charge while you spend hour after hour reading on holiday or at home. Reading in bright light can also be problematic on a tablet, as sunlight tends to glare off the screen in a way that renders text unreadable, or causes eye strain. The most popular ebook readers are from the Amazon Kindle range, and you can find out more on Amazon's ebook readers over on our Kindle reviews page. Amazon's family of devices includes cheaper models such as the Kindle (2016) and the Kindle Paperwhite, as well as pricier options like the Kindle Oasis. The latest Oasis should survive a half-hour dip in two metres of water, which you might like if you have painful memories of dropping expensive tech in the bath. Although Sony and Barnes & Noble no longer make ebook readers, Kobo continues to offer up alternatives to Amazon's family of products. But how do the two competing brands compare? Head to Amazon Kindle versus Kobo ebook readers to find out. Wi-fi or 3G ebook readers? All modern ebook readers are wi-fi enabled, which means you can use them to connect to your home internet to download books. This can be done without a computer and the process is usually straightforward. Pricier Kindles are often sold with a choice of two models, with a second, more expensive version offering 3G connectivity. This will let you use the internet to download new books when you're on the go, handy if you can’t connect to wi-fi. Most readers will be happy with a wi-fi equipped ebook reader, assuming you load up your device with content while you're at home on your own network. You can't currently buy a 3G Kobo ebook reader. If you’re looking for some new titles to fill up your ebook reader, there are a number of ebook stores to take a look at. Not every store will work with every brand of device. Popular ebook stores include the Amazon Kindle Store, Project Gutenburg, Apple iBooks and the Google Play Store. If you'd like to read on your smartphone or tablet, there are a range of free mobile apps to choose from, too. You simply download the app and then you can quickly access your next read. More on this below. Not all ebook readers accept the same file formats. For example, the Amazon Kindle only accepts the AZW format that's unique to Amazon books, while others will be able to access many more ebook types. You can't access ePub files on the Kindle Oasis or older Paperwhite, but you can on Kobo models. Our expert ebook reader reviews will let you know exactly what formats an ebook reader can display. Older ebook readers used e-ink screens which weren’t illuminated and couldn’t be read in the dark. However, newer models have illuminated screens so that you can read in bed long after your partner has turned out the lights. We rate how easy it is to read from ebook reader screens in a range of light conditions so you can find the perfect model for you. Not all ebooks are published in the same format, so where you shop will, to some extent, depend on the type of ebook reader you have. Most ebook stores sell ebooks published in the ePub format, an official standard of the International Digital Publishing forum (IDPF). This industry standard format is the most widespread and is used by almost all the main stores: Apple's iBooks, Kobo, Google Play and eBooks.com for Android devices. Using this open format means ebooks can be downloaded into one library - wherever you shop - and moved between devices if you decide to upgrade your ebook reader. But ePub content can't be downloaded onto the Amazon Kindle, which uses its own format. Unlike the other ebook stores, Amazon's Kindle store sells ebooks published in its own proprietary format, AZW. This is the only format that the Kindle accepts, so buying a Kindle ties you to the Amazon store for your ebooks. You can still shop on Amazon if you have a different brand of e-reader, but you'll need to download an app on your phone for buying and storing ebooks bought on Amazon. If you decide to shop elsewhere, you'll end up with two separate libraries that split your ebooks up, so you won't be able to search across all your titles in one go. Amazon isn't the only store to have its own dedicated e-reader platform linked to its own ebooks store. Apple's iBooks app will display ebooks in your iPhone or iPad's iTunes media library, and Kobo has its own store linking to its ebook reader device. Because these stores sell ebooks published in the widespread ePub format, any titles downloaded from different stores will be merged in the same place on your ebook reader. We’ve put ebook readers from Amazon and Kobo through our rigorous lab tests, so we can give you a definitive verdict on which one is best and how they rate against each other. Take a look at our Best Buy ebook readers page to find out which models are worth buying.